1. 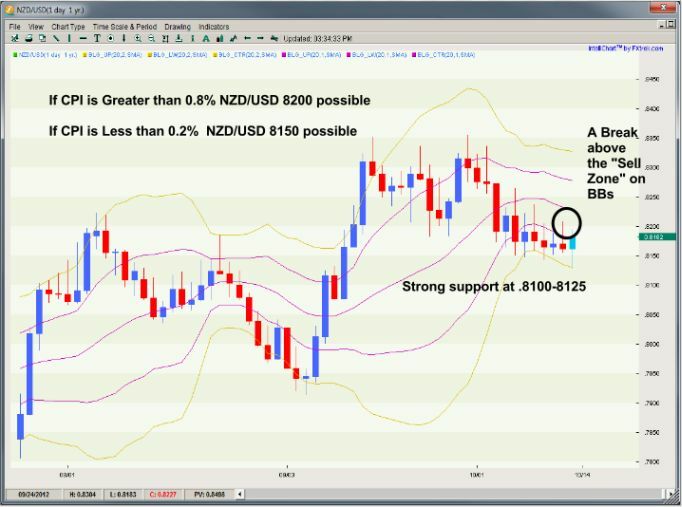 NZD/USD – Any Surprise from CPI? New Zealand consumer prices are scheduled for release at 5:45PM ET / 21:45 GMT. CPI numbers are only released from New Zealand on a quarterly basis, so when they are on the calendar, NZD/USD traders will watch the data closely. However this quarter, predicting the directional surprise of CPI is difficult because food prices decreased in Q3 but commodity prices rose. This suggests that producers could be having a tough time passing higher prices onto consumers. Yet the level of inflation is important to every central bank and softer inflationary pressures builds the case for a rate cut from the Reserve Bank of New Zealand. Therefore if CPI rises by less than 0.2% or turns negative, the NZD/USD will fall sharply as traders position for easing from the RBNZ. If CPI rises by more than 0.8%, we expect only a modest rally in NZD/USD because at a yoy rate of 1%, inflationary pressures are extremely modest in general. Kiwi made a very strong recovery off the session lows showing that the .8125-.8100 support remains in place having been tested thoroughly over the past several weeks. The pair has a turn out of the Bollinger band sell zone and now encounters the next resistance level at the 20 SMA overhang at .8229. A break below the key .8100 however would be extremely bearish suggesting a run to .7900 support. The minutes from the most recent Reserve Bank of Australia monetary policy announcement is due at 8:30PM ET / 20:30 GMT. This one of those event risks that will most certainly trigger volatility in the currency. The RBA cut interest rates by 25bp this month and investors will looking for reasons why. The rate cut was not widely expected and we all want to know what pushed the central bank over the edge. 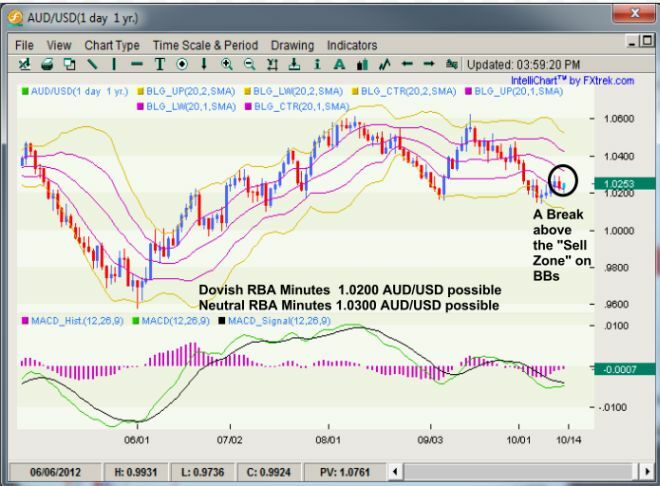 Given the RBA’s decision to ease, we believe that the minutes will most likely be dovish and in turn negative for the AUD/USD. However what is important is not just what the central bank has done but what they plan to do in the future. If the RBA hints that more easing is necessary, the AUD/USD could fall sharply but if the statement is neutral, the AUD/USD will rally because right now, the market has priced in another 25bp rate cut in November. While there’s opportunity to enter the trade before the release, the smarter decision may be to wait because central bank minutes tend to lead to continuation in currencies because they can reset monetary policy expectations for days to come. The Aussie put in a surprisingly resilient performance today recovering off the session lows to close near days highs on a bullish daily candle that put it once again outside of the Bollinger Band sell zone. MACD is on the verge of turning into positive territory providing further evidence of turn in momentum. A break below 1.0200 negates the bullish bias. U.K. Consumer Prices are scheduled for release at 4:30 AM ET / 8:30 GMT. As an inflation fighting central bank, CPI is always an important release for the British pound. This is particularly true for this week’s release because the Bank of England is widely expected to be the next central bank to ease. If consumer prices rise less than 0.2%, then the case for more Quantitative Easing hardens significantly, which will be bearish for GBP/USD. However if CPI rises by more than 0.6%, then the BoE may keep policy unchanged for longer because annualized inflation is still running above their 2% target. Typically PPI is used to forecast CPI but in the case, these reports are released simultaneously. According to a survey from the British Retail Consortium, price growth slowed last month so if we had to take a punt, it would be for softer and not hotter CPI. Either way, the lack of any clear leading indicators means it may be smarter to enter the trade post release. 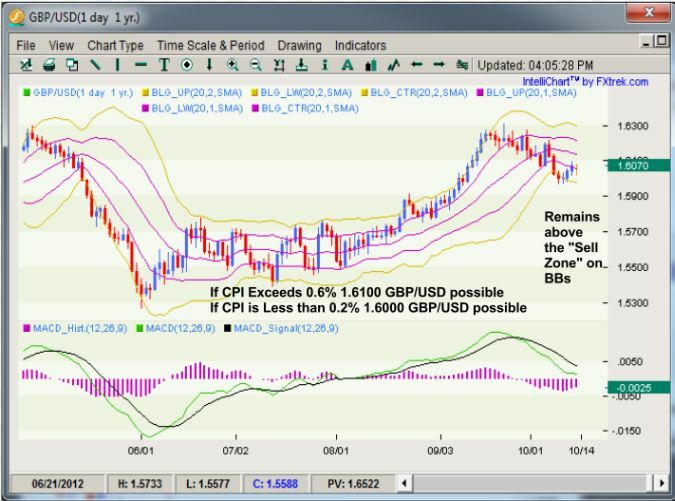 GBPUSD remains supported just above the 1.6000 line as it makes its way above the BB “Sell Zone”. Momentum however remains negative with MACD showing little movement towards the zero line. The German ZEW survey is scheduled for release at 5AM ET / 9 GMT. Investor confidence is always difficult to predict especially in this current market environment where the outlook for Spain and Greece are still uncertain. However the ZEW survey can be a market moving release for the euro, particularly if there is a big surprise. If the German ZEW Economic Sentiment index, which measures the expectations of investors rises from -18.2 to -10 or better, the EUR/USD should rally. If the data shows deterioration in sentiment with the index falling to -18 or lower, the EUR/USD should sell-off sharply. This is definitely one piece of economic data that should traded after the number is released and not before. 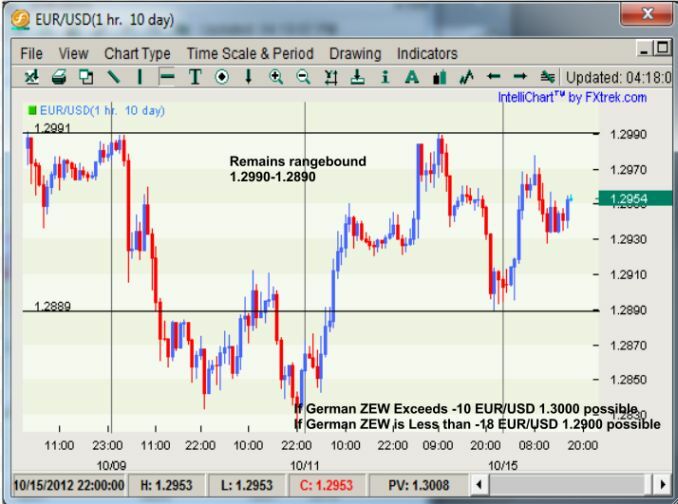 The euro remains trapped between 1.2990-1.2900 for the 2nd day in a row with the pair recovering nicely off Asian session highs but unable to take out the key 1.3000 level. A break either way could connote more directional momentum ahead. US Consumer prices are expected at 8:30AM ET / 12:30 GMT followed by Industrial Production at 9:15AM ET / 13:15 GMT. We have good reasons to believe that consumer prices and industrial production will surprise to the upside. Gas prices increased significantly in the month of September, which will contribute positive to headline CPI. However producer price growth eased, giving us only a medium level confidence on this trade. Industrial production on the other hand should rebound given the improvement in the ISM manufacturing report last month. If CPI exceeds 0.9%, the case for an earlier withdrawal of monetary stimulus increases, which is positive for USD/JPY. However if CPI grows by 0.2% or less, USD/JPY could decline as lower inflationary pressures supports the case for prolonged easy monetary policy. 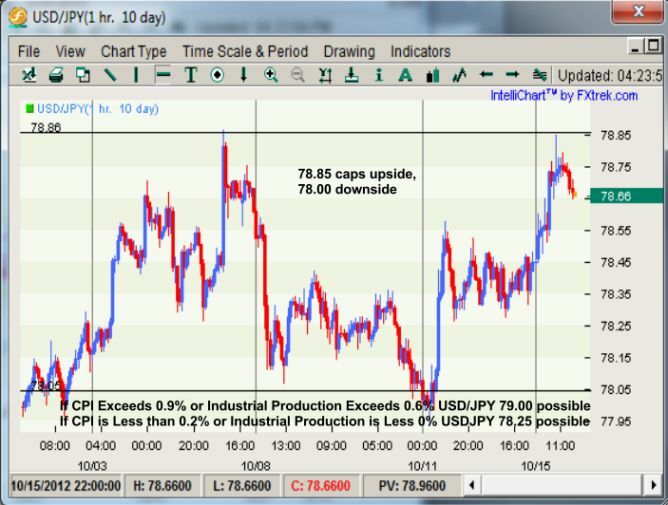 USDJPY remains in tight carved out range as 78.85 continues to cap to the upside, although the move above 78.50 today can be viewed as bullish for now. However the pair needs to take out 79.00 before any upside bias can be established.